If you live in the United States, spring has sprung, and summer is well on its way. And if you live on the east coast of the United States, that means hurricane season is almost here. Typically recognized as running from June 1 – November 30 in the United States, the peak of Atlantic hurricane season is usually around September 10th of each year. Approximately 10 storms develop into “named storms” each year – these storms are seen as being significant enough to merit naming by the NOAA. Of these storms, around 6 become hurricanes each year, and around 2.5 become “major” hurricanes of category 3 or greater. Most of these hurricanes are relatively harmless and end up dispersing before doing significant damage. But every once in awhile, weather conditions are perfect for creating devastating storms that swell in size, intensity, and speed. 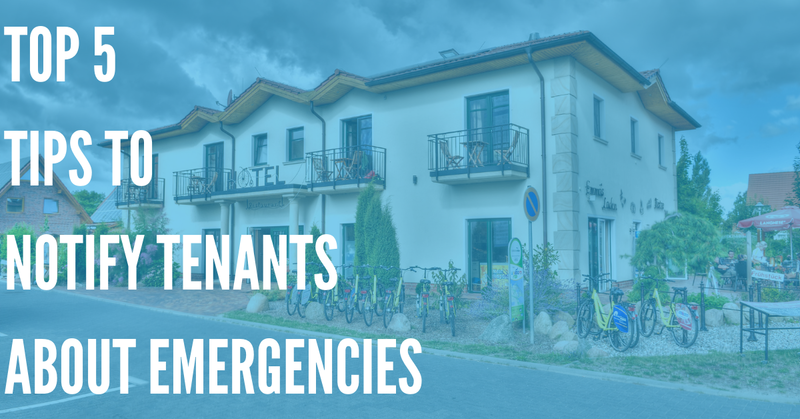 These storms represent a serious danger to both people and property, and usually require emergency evacuation procedures. 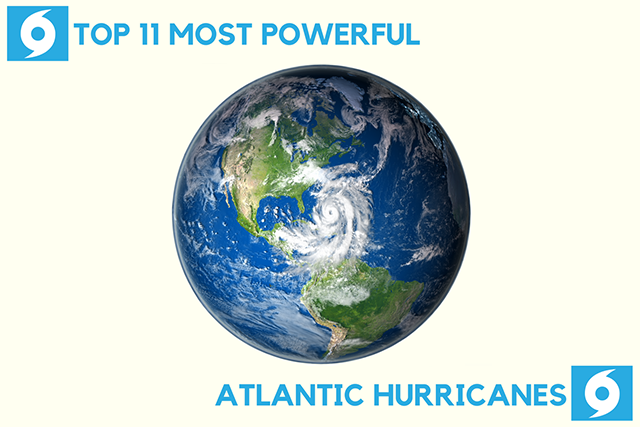 In order to give you an idea of the size, intensity, and damage caused by these storms, we’ll take a look at the top 11 most powerful Atlantic hurricanes of all time, and how they have affected the United States over the years. NOTE: As per NOAA guidelines, these storms have been arranged by pressure – from lowest to highest. While storms are often ranked by wind speed alone, the NOAA prefers to rank storms by pressure. 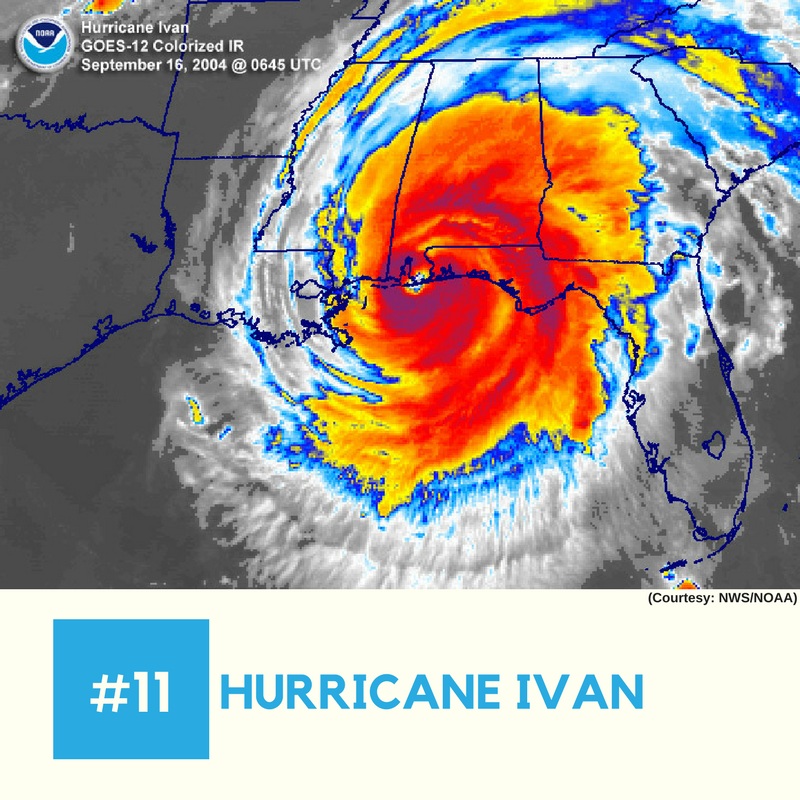 Hurricane Ivan was the ninth named storm and the sixth hurricane to occur during the relatively active 2004 hurricane season. The storm system began forming in early September, around the peak of oceanic activity for the 2004 Atlantic hurricane season. Hurricane Ivan began to form September 2, 2004, southwest of Cape Verde. The system began moving west, and began to strengthen gradually. It became classified as a tropical storm by September 3, 2004, and by September 5, it had reached hurricane status. By September 9, winds in the hurricane had intensified to 160 mph, as it passed around Jamaica and headed westward towards the United States. Peak strength was reached on September 12, 2004, when the hurricane passed through the Yucatán Channel. The storm then began to weaken slightly to category 4 strength before making landfall on the Gulf Coast of the United States. In Louisiana and Mississippi, thousands of Americans were evacuated. In Florida, thousands of homes were destroyed, and multiple bridges were heavily damaged by the high winds of Hurricane Ivan. According to the NOAA, Hurricane Ivan is the 6th costliest hurricane to make landfall in the United States, with damages at $22.8 billion, adjusted for inflation. 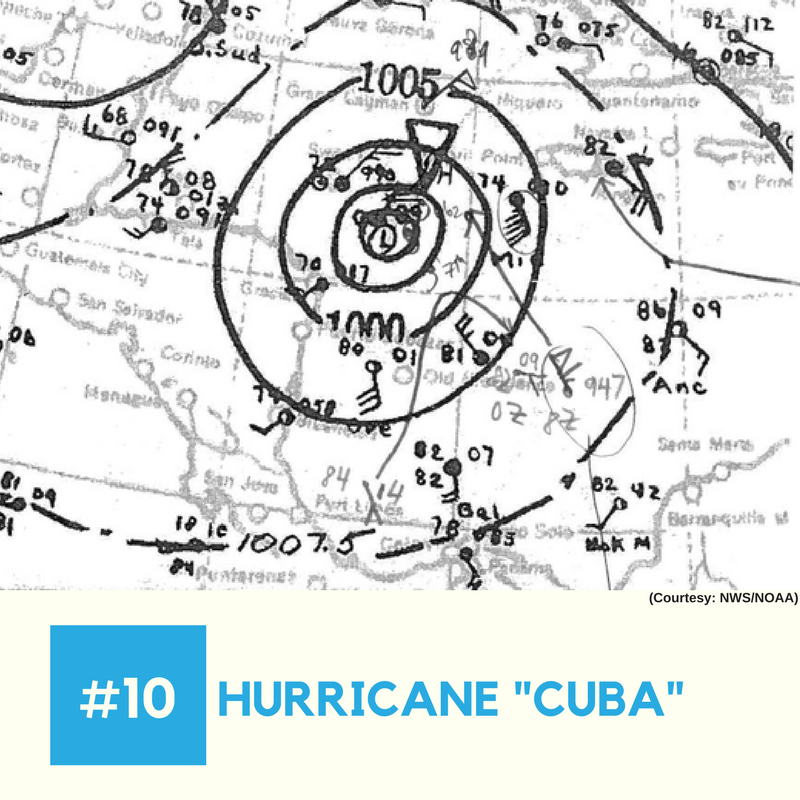 Measured before the NOAA began naming storms, Hurricane Cuba is the earliest hurricane to be classified as a category 5 on the Saffir-Simpson scale, and its low pressure of 910 hPa places it at tenth on our list of the most intense Atlantic hurricanes. This hurricane formed on October 141924 in the Caribbean, and began picking up steam as it moved in a northwesterly direction. By October 16, it had officially attained hurricane status. By October 18, the hurricane had peaked at an intensity of 910 hPa, and sustained winds of over 165 mph. Almost immediately after the hurricane hit peak strength, it made contact with Cuba. To this day, it is the most powerful hurricane to have ever hit the country. After moving past Cuba, the hurricane weakened quite a bit, reaching Florida with peak winds of around 90mph. Despite the catastrophic damage done to Cuba, Florida was relatively unaffected. There were no reported fatalities, though heavy rainfall occurred all throughout the state. Hurricane Dean was the strongest tropical cyclone observed in the 2007 Atlantic hurricane season. It first formed on August 13, 2007, near the west coast of Africa. 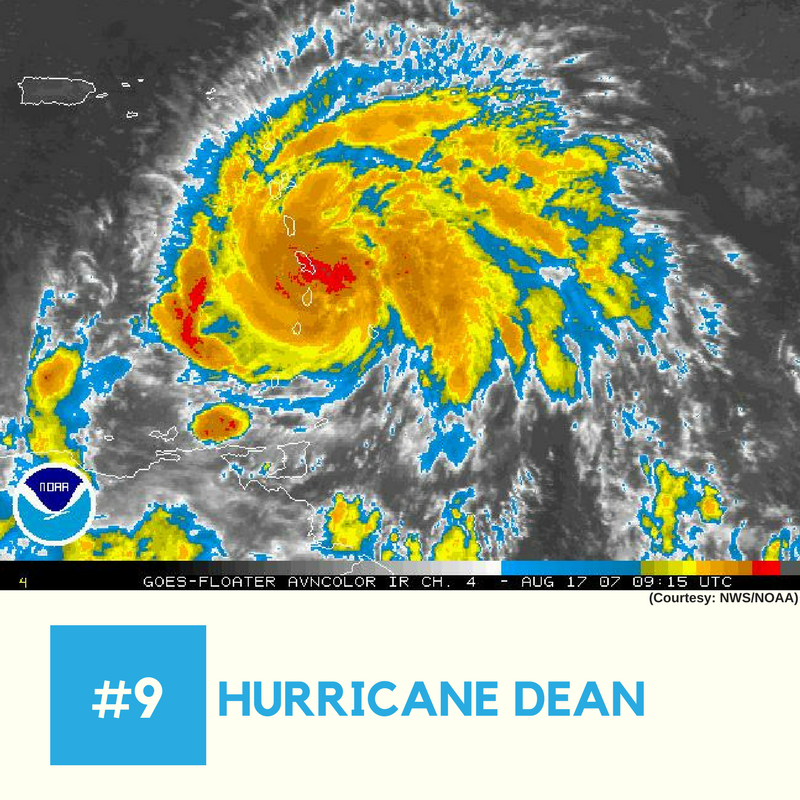 Thunderstorms and a large tropical wave had provided an ideal environment for the hurricane to grow, and by August 14, the tropical storm was named Dean. Tropical Storm Dean continued to move westward very quickly, and grew in intensity. By August 16, it had attained Hurricane status, and was around 600 miles east of Barbados. The system continued to move west and grow in size. By August 17, it had achieved Category 3 status, and by August 20, Hurricane Dean attained peak wind speeds of 160mph, making it a Category 5 hurricane – only 210 miles from its first landfall on the Yucatán Peninsula. Damage to the affected regions, including Jamaica and other Caribbean islands, was vast. It took months for cleanup and repair efforts to restore these areas. However, Hurricane Dean never made it to the United States, though heavy flooding and rainfall were reported in Florida and Alabama. Hurricane Mitch was the most destructive hurricane of the 1998 Atlantic hurricane season, and attained astonishing peak sustained winds of 180mph. Formed in the Caribbean on October 22, 1998, Hurricane Mitch encountered extremely favorable conditions. 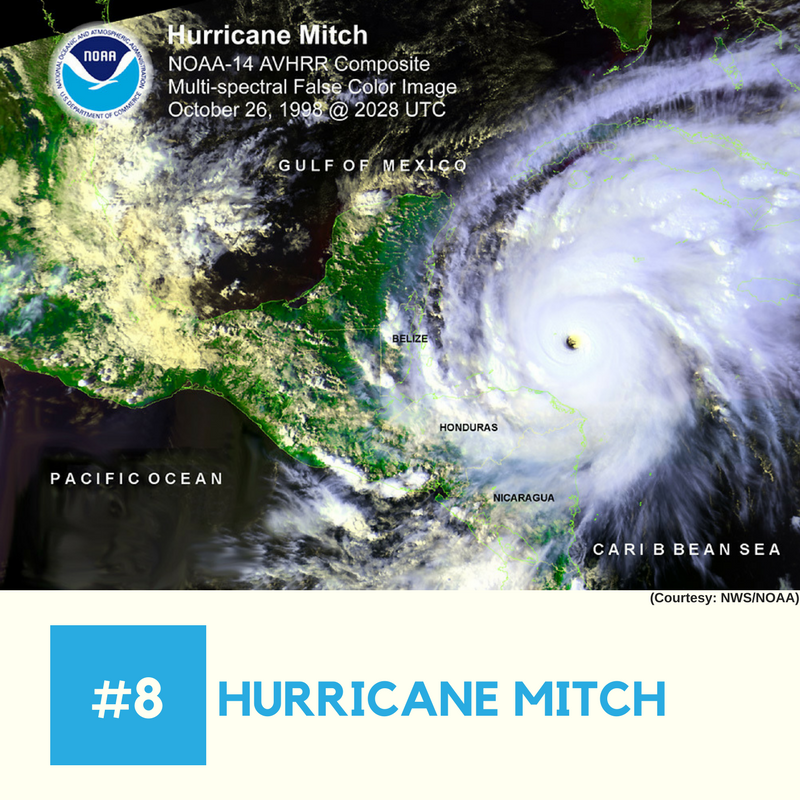 In only 4 days, Hurricane Mitch attained Category 5 status on October 26, making it one of the most rapidly-intensifying hurricanes on record. Throughout October 29 – Nov 3, Hurricane Mitch slowly moved throughout Central America, dropping record-breaking amounts of rain (up to 75 inches) in Honduras, Guatemala, and Nicaragua. Deadly floods and rainfall killed up to 11,000, and displaced nearly 2.7 million. The total damage from the flooding was estimated at $9.79 billion, adjusted for inflation. In the United States, only Florida was affected. Hurricane Mitch had then slowed down to a tropical storm, and made landfall on the Florida Keys, and the west coast of the state. A total of $40 million in damage and 2 deaths have been reported, and around 645 houses were destroyed by tornadoes caused by the storm. Hurricane Katrina stands alone as the single most devastating storm to ever hit the United States. A combination of powerful winds and incredible intensity at landfall caused this hurricane to wreak havoc all along the Southern and Eastern United States. Hurricane Katrina began forming on August 23, 2005, over the Bahamas. After passing over Florida, it began to quickly deepen and grow in intensity. 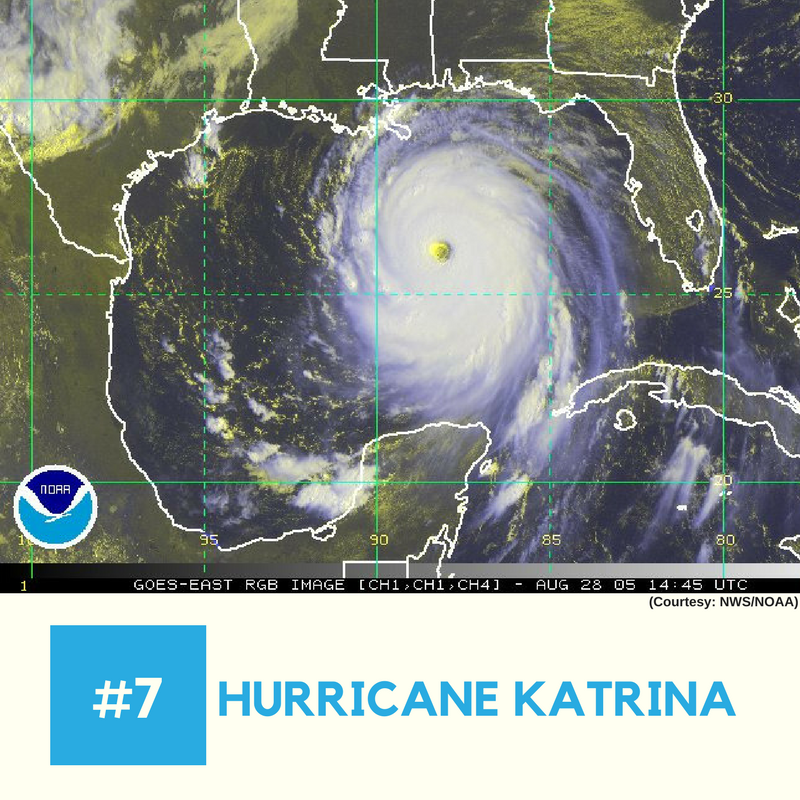 By August 26, Katrina had become a Category 5 storm, and began moving toward southeast Louisiana. Though damage was done in several states, and the effects of the storm reached all throughout the eastern United States, the most catastrophic damage was done in New Orleans. Over 50 levees were breached by the hurricane, which caused nearly 80% of the city to become flooded, killing over a thousand in New Orleans alone. Hurricane Katrina remains the most damaging hurricane on record, costing nearly $138.07 billion when adjusting for inflation. 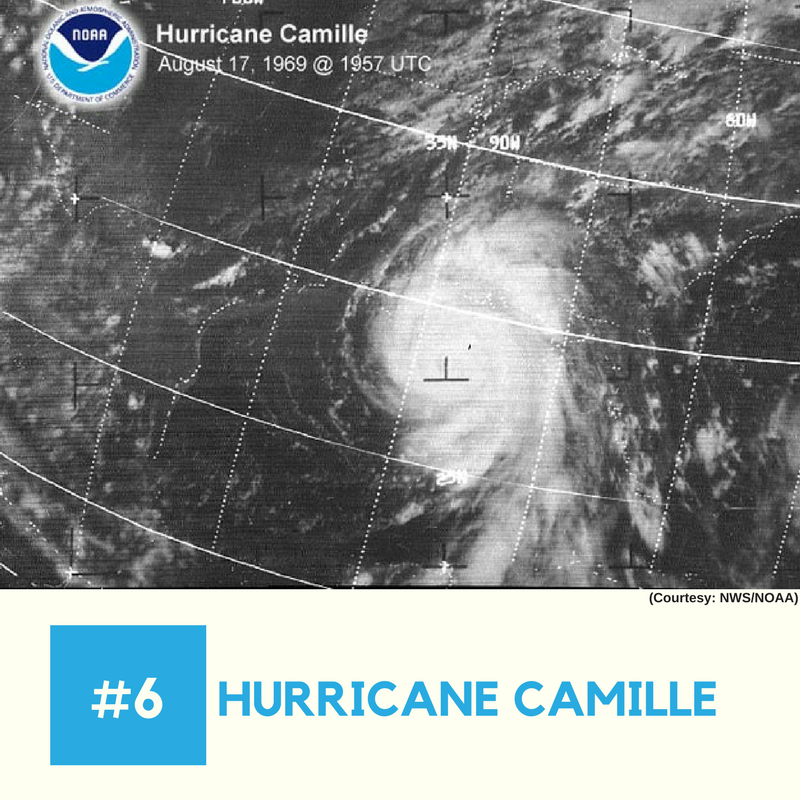 Hurricane Camille was the strongest tropical cyclone to occur during the 1969 Atlantic hurricane season. It formed on August 14, and passed by Cuba at Category 2 intensity. After this, the storm began picking up speed, and made landfall over the Gulf of Mexico with sustained winds of over 175 mph, and a storm surge of over 24 feet. The coast of Mississippi was flattened by the storm, and flooding continued inland towards Virginia. Overall, more than a dozen states were affected by the storm, and it’s estimated that Hurricane Camille killed over 259 people. 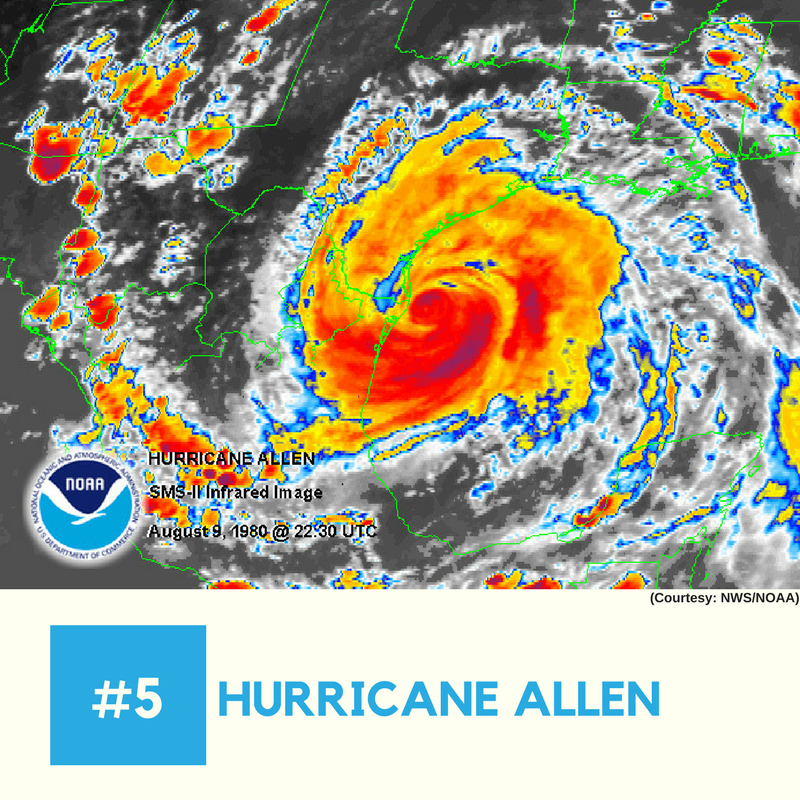 Hurricane Allen was the first hurricane to form during the 1980 Atlantic hurricane season, and it was also the strongest. This is rare – usually, stronger hurricanes form later in the year. It formed on July 31, 1980, and quickly became a Category 5 hurricane. Hurricane Allen was exceptional in many ways. It attained sustained winds of 190 mph – the highest recorded in an Atlantic hurricane, and spent more time at a Category 5 designation than any other hurricane on record. Throughout the course of its life, the hurricane passed over Haiti, the Gulf of Mexico, and southern Texas, causing heavy damage, plentiful rainfall, and causing nearly $4 billion in damages throughout its life, as well as 290 fatalities. Hurricane Rita was one of three major hurricanes during the record-breaking 2005 Atlantic hurricane season, and is the fourth-most intense Atlantic hurricane ever to be recorded. 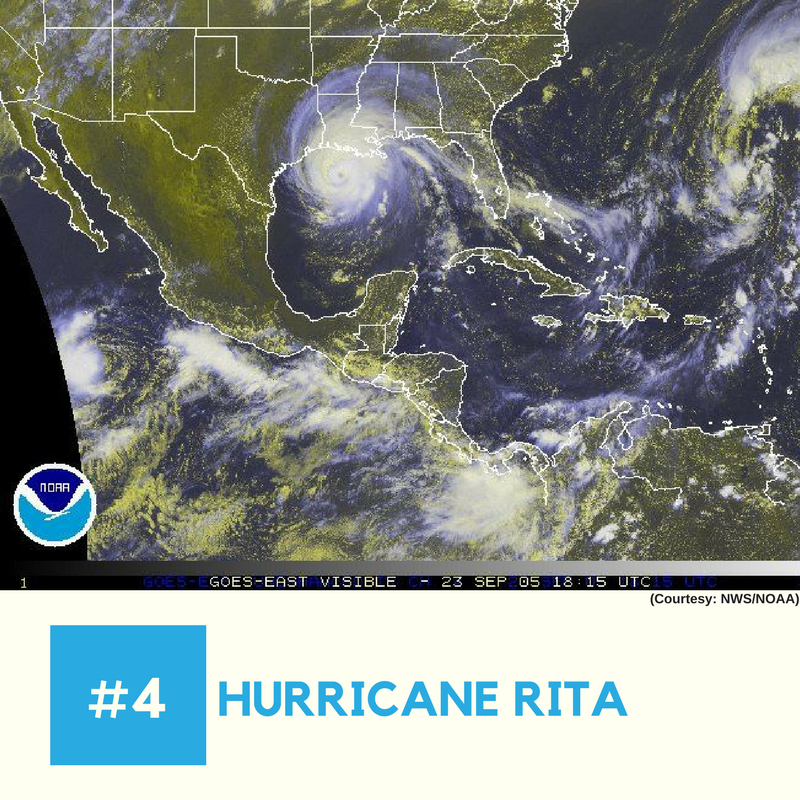 Rita formed near the Bahamas on September 18, 2005 and quickly moved westward, picking up speed until it reached Category 5 status on September 21st. Before making landfall between Texas and Louisiana, however, the storm weakened to a Category 3. Despite this, Hurricane Rita still caused massive damage to the United States. This was especially true in Louisiana, where New Orleans was still recovering from the catastrophic damage caused by Hurricane Katrina, just one month earlier. It’s estimated that as many as 120 deaths in 4 states were caused by the hurricane, and that over $15 billion in damages were caused by Rita. 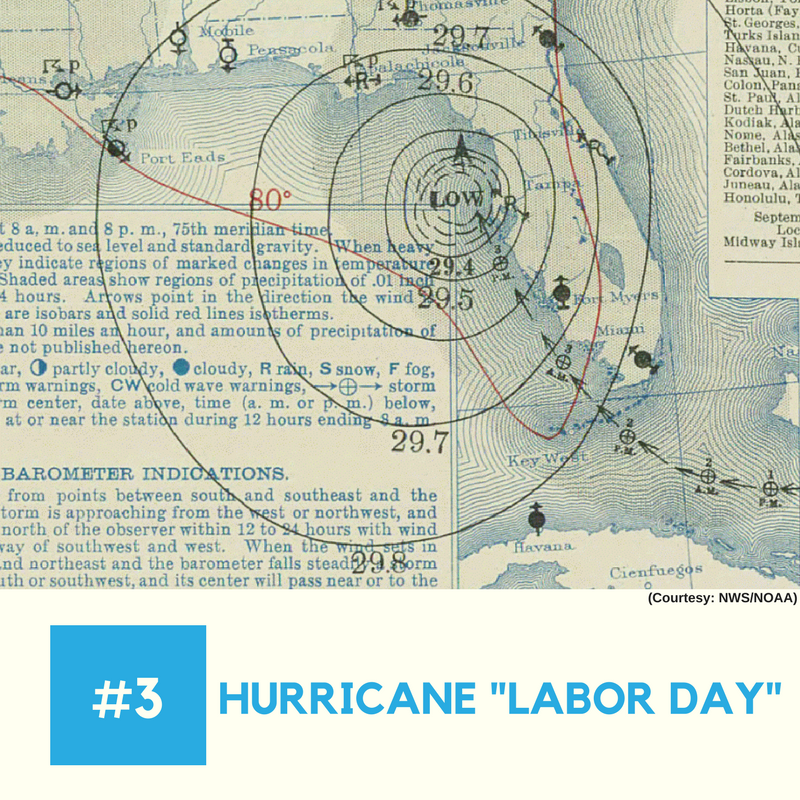 The 1935 Labor Day Hurricane is one of only 3 hurricanes to impact the United States at Category 5 intensity. Forming on August 29, 1935 off of the coast of the Bahamas, this tropical storm strengthened into a hurricane by September 1, and impacted the Florida Keys, as well as Georgia, The Carolinas, and Virginia, causing catastrophic damage. A storm surge of approximately 20 feet swept over the keys, destroying key parts of the Florida East Coast Railway, obliterating countless homes, and killing a total of 408 people across the United States. Hurricane Gilbert was formed on September 8, 1988, and is one of the most intense hurricanes to have ever struck the Caribbean and the Gulf of Mexico. It is also one of the single largest storm systems to have formed – at one point, its winds measured more than 575 miles in diameter. 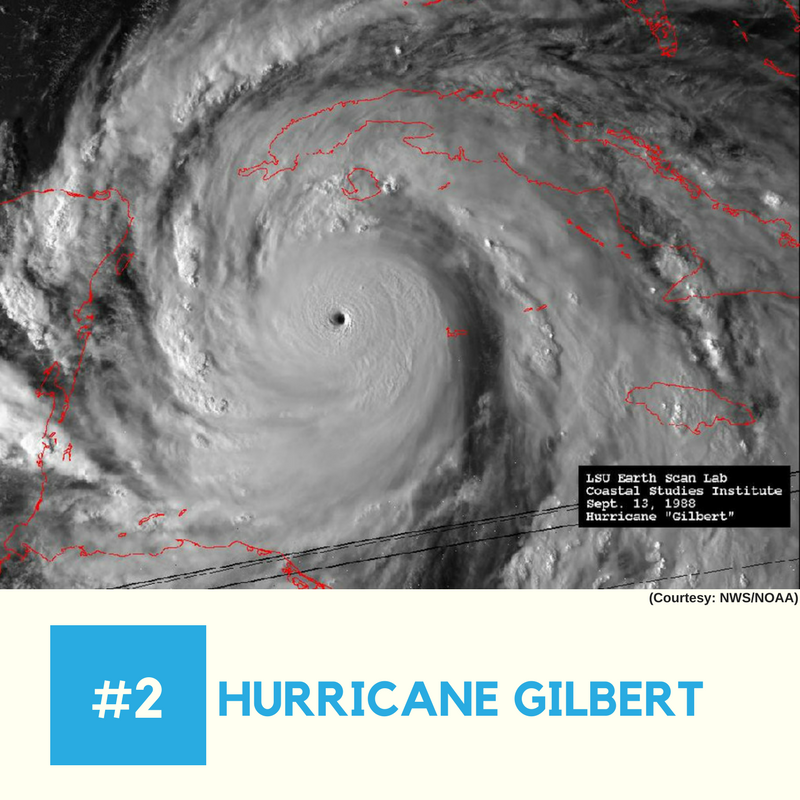 After forming on September 8, Hurricane Gilbert quickly picked up steam, intensifying into a Category 3 hurricane on September 11, and striking Jamaica. After passing through Jamaica, the storm intensified further, becoming a Category 5 by September 13. It then made landfall over the Yucatán Peninsula, and continued into the Gulf of Mexico, where it made landfall on Mexico as a Category 3 storm. Given its positioning of the storm, the United States was not affected by most of Hurricane Gilbert’s devastating effects. Damage was limited to Texas, where Gilbert caused a 3-5 foot storm surge, and 29 tornadoes caused by the inclement weather. However, Mexico and the Caribbean countries affected by this hurricane were not so lucky. 318 people perished, and nearly $15 billion in damage was done by Hurricane Gilbert. 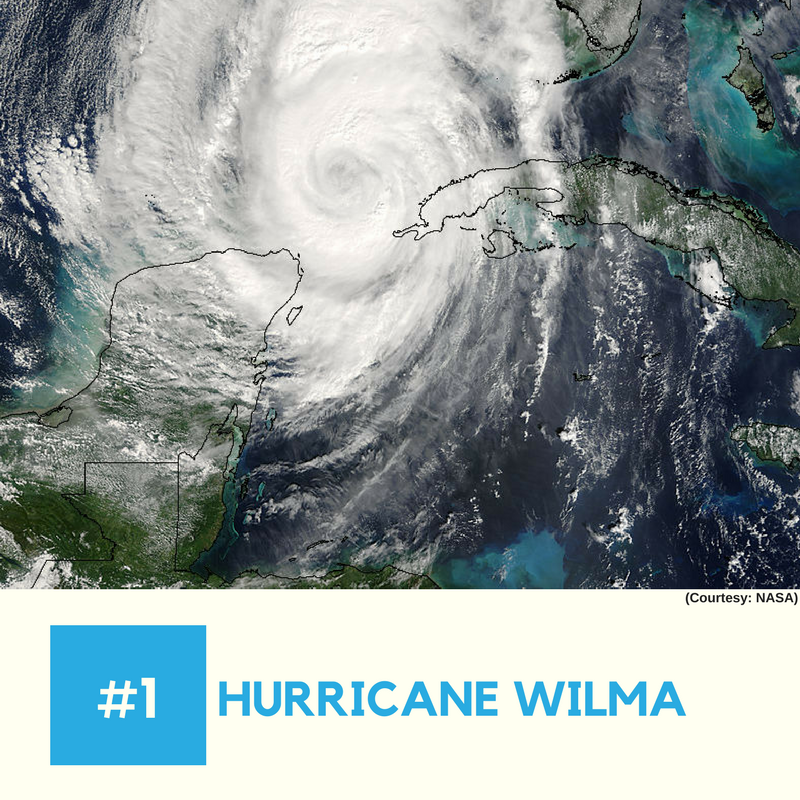 Hurricane Wilma is the single most intense and powerful Atlantic cyclone of all time. Formed on October 16, 2005 near Jamaica, Hurricane Wilma became a Category 5 hurricane within only three days, on October 19, 2005. After passing through the Yucatán Peninsula and the Gulf of Mexico, Hurricane Wilma made landfall in Cape Romano, Florida with winds of over 120 mph, and caused serious damage to the state. At least 62 deaths were reported as a result of Hurricane Wilma, and nearly $38 billion in damages was done – at least $26 billion in the US alone. This ranks Wilma as the fifth costliest storm in all of United States history, and it remains the most recent major hurricane to make landfall in the contiguous United States. If you’re worried about hurricanes this Atlantic Hurricane season, we recommend you take appropriate precautions – especially if you’re on the east coast of the United States, or in the Gulf of Mexico. Always listen to NOAA broadcasts if there is a hurricane bound for your area, and make sure to evacuate if you’re told to. It’s not worth risking your life. 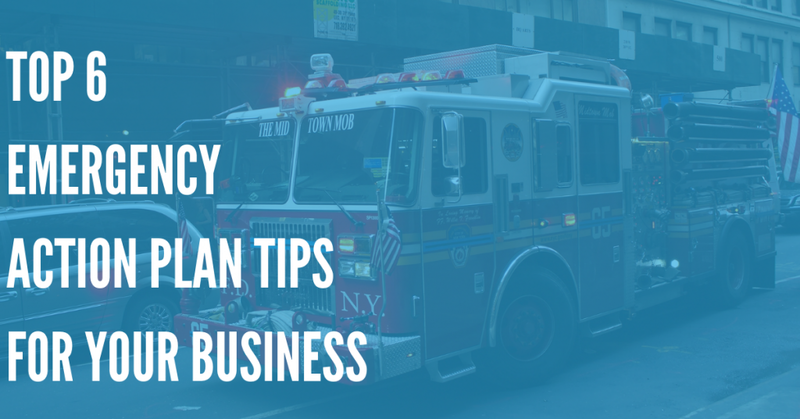 Consider also setting up an emergency alert system using advanced software like DialMyCalls. Using DialMyCalls, you can quickly and easily send messages about weather conditions to family members, church congregations, schools, and much more. 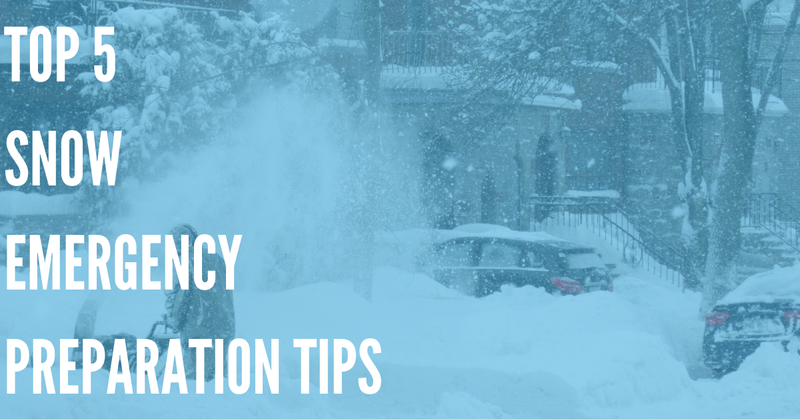 For more information about hurricane preparedness, we recommend checking out Ready.gov, where you’ll find plenty of helpful tips on how to keep yourself safe, should a hurricane be headed your direction. *The images contained in this blog post were provided by the NWS/NOAA — DialMyCalls is not affiliated or endorsed by the NWS/NOAA.